Don't miss the 2018 1oz Australian Silver Swan! The 2018 1oz Silver Swan is certainly one of the year's most eagerly awaited bullion coins. The second in the Perth Mint's Australian Swan series, a limited mintage of just 25,000 adds to the coin's already considerable appeal. Don't miss the opportunity to add the 2018 1oz Silver Swan to your collection – order now with coininvest.com. 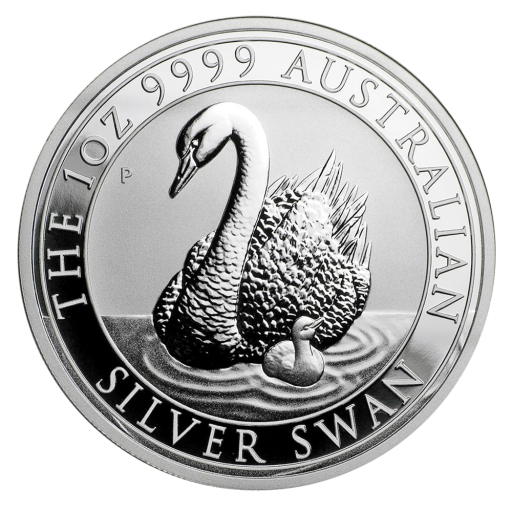 The first Australian Swan silver coin was issued in 2017 by the Perth Mint in Western Australia. Its instant success prompted the mint to release an equally successful gold version, again with strictly limited mintages. Now established as a series, the Silver Swan is one of the Perth Mint's most exciting projects. Known for wildlife series coins like the Nugget Kangaroo and the Silver Australian Kookaburra Series, it was only a matter of time before the Mint turned its attention to its closest neighbour, the Australian Swan. For centuries, these majestic birds have made their home on the Swan River where the Perth Mint has been based since it was founded in 1899. A much-loved symbol of Western Australia, the regal swan is the subject of an annually changing reverse design. For 2018, the Mint's artists have chosen a beautifully-detailed image of a mother swan and cygnet. Ripples extend under the border and emerge at the coin's rim as the pair glide effortlessly across the surface. The obverse features an official portrait of HM Queen Elizabeth II. The 2018 1oz Silver Swan is a smart choice for both collectors and investors thanks to its purity, low mintages, impeccable quality, and detailed designs. As a trusted supplier for the Perth Mint, CoinInvest is delighted to introduce the 2018 1oz Silver Swan. Order this magnificent silver bullion coin online for fast, secure delivery to your preferred address.